The 2017 WSOP Main Event has really got into full swing as Day 2AB on its schedule ended mere hours ago. A total of 2,219 players returned from Days 1A and 1B to continue their participation in the world’s most prestigious No-Limit Hold’em tournament. However, not all of them were lucky enough to survive throughout the day. The field was reduced to just 1,100 hopefuls after the scheduled five levels of play. The Day 1A and Day 1B fields remained separate on Day 2AB. The chip counts chart showed that Mickey Craft completed the day as the Day 1A flight chip leader with 608,100, while Lawrence Bayley had accumulated the largest stack among the Day 1B players by the time the clock struck the end of the final level for the day. He bagged 618,000 worth in chips. 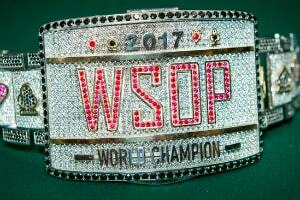 The 2017 edition of the WSOP Main Event enjoyed great interest among both poker professionals and enthusiasts from all around the world. In fact, this year’s tournament became the third largest in the Series’ history. It attracted 7,221 entries who generated a prize pool of $67,877,400. Day 1C of the World Championship was actually a record-setting one, breaking the record for the largest-ever single-day field since the WSOP was established back in 1970. A total of 4,262 players joined the tables of Rio All-Suite Hotel & Casino on that particular day. Day 2AB saw a number of notables make it through all five levels, with some of those being Charlie Carrel, Mike Matusow, 2004 WSOP Main Event Champion Greg Raymer, and 2005 WSOP Main Event Champion Joe Hachem. Other former Main Event winners were less lucky and got eliminated on Tuesday. Defending Champion Qui Nguyen was among them. Failing to hold up against James Akenhead, Nguyen missed his chance to win the major tournament in back-to-back years. Canada’s Jonathan Duhamel, who won the event in 2010, 2002 Main Event Champion Robert Varkonyi, Phil Laak, Ole Schemion, and Christian Harder were among the other notables to have failed reaching the end of the five levels played on Day 2AB. The remaining survivors are set to return at the poker tables of the host venue on Thursday for Day 3. The Day 2AB field will be merged with the one comprised of the Day 2C survivors. And Day 2C is set to be played today. It will see 3,300 players contend for a spot among the hopefuls who will continue their road to a potential victory in this year’s Main Event. For the very first time in several years, the WSOP Main Event Final Table will not be played in November but as part of the summer Series festival. The nine finalists will begin their fierce battle for the $8.15-million first-place prize and the specially crafted Champion’s gold bracelet on July 20.